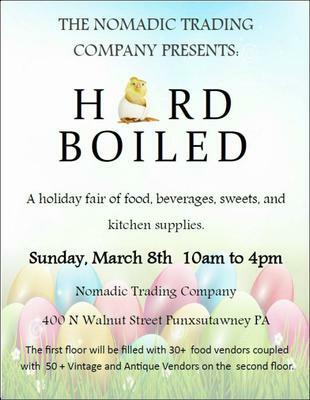 The Nomadic Trading Company at 400 N Walnut Street Punxsutawney PA is hosting a food fair. All designed to help you prepare for the holidays our "Hard Boiled" Fair, will include: Food, Wine, Dips, Cakes, Cookies, Fudge, Cheese, Gadgets, Knives, Sauces, Relishes and along with Demonstrations! 30 Food Vendors on the first floor, coupled with 55+ antique and vintage vendors on the second floor --complete for a huge shopping experience. Thank you for letting us know about your March 8th "Handmade" Artisan Fair, 2015.